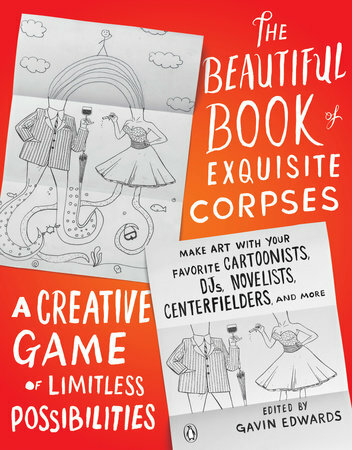 Writer Gavin Edwards has produced a cool new book called The Beautiful Book of Exquisite Corpses: A Creative Game of Limitless Possibilities (due out August 28), and I’m one of the contributors. You can be a contributor too, because the premise of the book is based on the old surrealist game cadavre exquis, in which a collection of words or images is collectively assembled. Much of the book works like the “parlor game” Picture Consequences, where a piece of paper is folded into three sections. The first player draws the head—leaving only small connective lines for clues—and passes it unseen (by means of folding) to the second player who draws the body, then on to the third player who draws the legs. The composite person or creature is then revealed to all by unfolding the paper. Each page of the book has one of the three section already drawn in, leaving two other sections for you and your friends/family to fill in. Other parts of the book take the same premise, but with words, using a single sentence to launch a story. 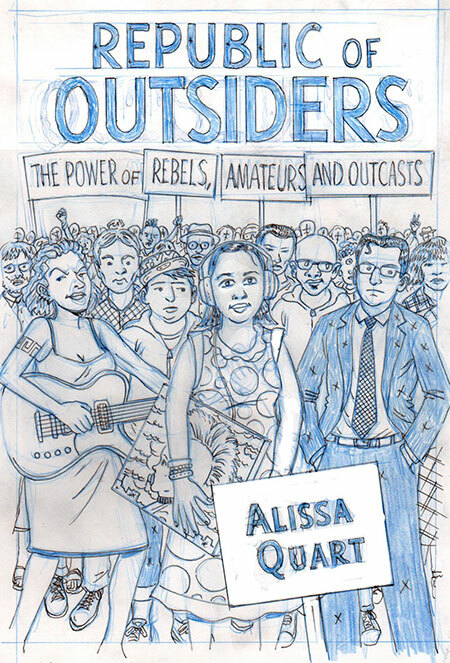 Sparking off the various images and stories are 90 visual contributors and 20 verbal contributors, such as tons of cool cartoonists (the likes of Dean Haspiel, Jessica Abel, Leela Corman, Jim Woodring, Dustin Harbin, etc.) 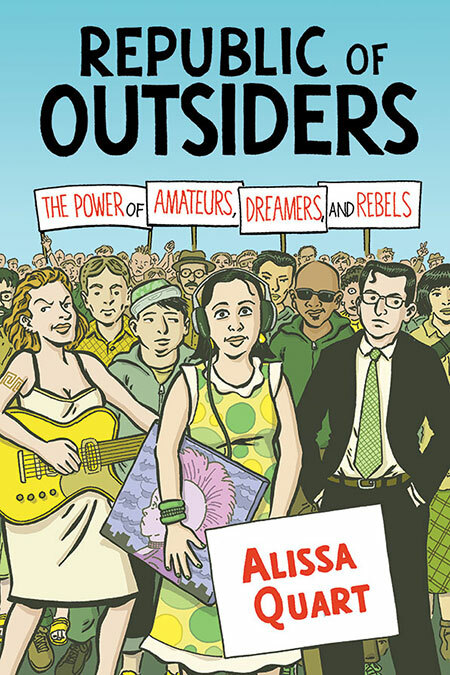 and an eclectic group of others like authors Aimee Bender, Chuck Klosterman, and Susan Orlean, actor Griffin Dunne, former baseball player Lenny Dykstra, musicians Chris Frantz and Robyn Hitchcock, comedian Stephen Fry, journalist Emily Nussbaum, DJ Moby, and former VJ Martha Quinn. 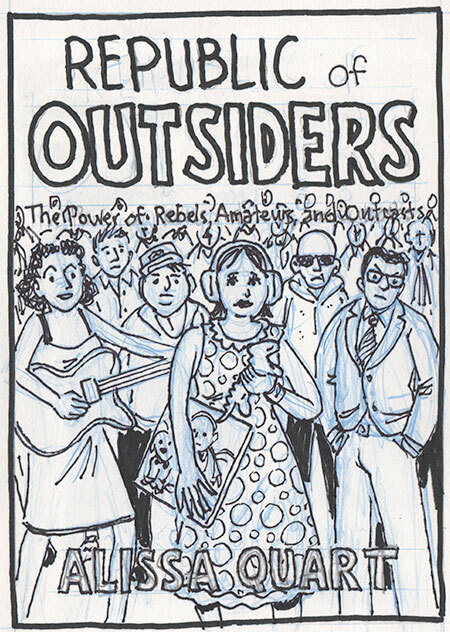 As a cartoonist I’ve always been fascinated by “collectively assembled” projects, going back to collaborations with writers like Harvey Pekar, Brooke Gladstone, and Nick Flynn; the exquisite corpse comic I did with Dean Haspiel, Because of You; and of course Flashed: Sudden Stories in Comics and Prose, which I co-edited with my brilliant wife Sari Wilson. 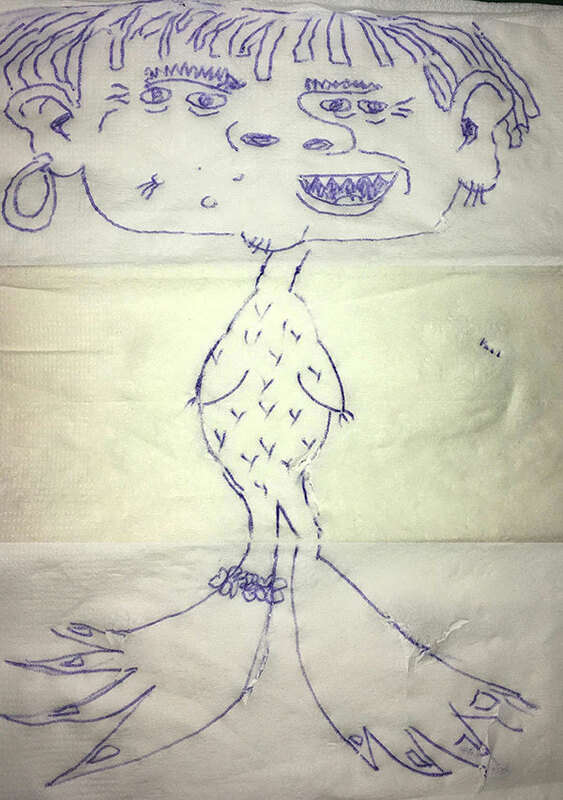 In honor of the project, this past weekend Sari, Phoebe and I did a couple of “Picture Consequences” drawings on napkins at the local diner. This one has been dubbed the Chicken Seawitch. Can you figure out which of us drew which section? 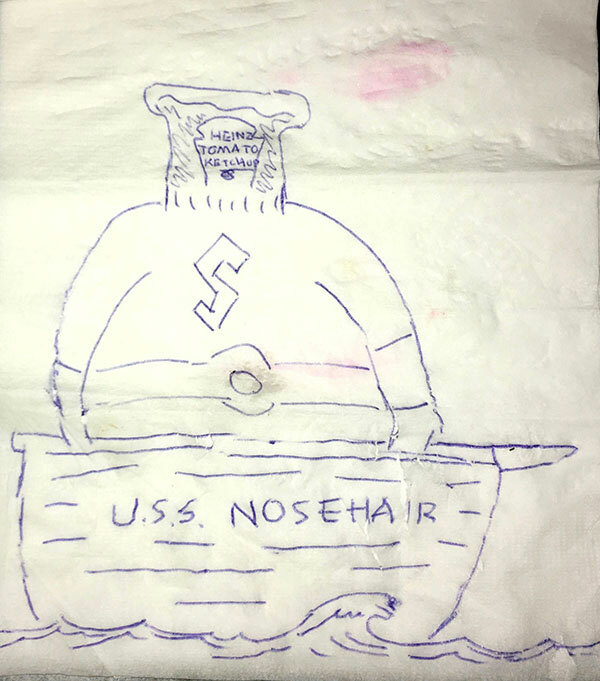 And here is a Nosehair Ketchup Hero. Again, can you figure out who did what? 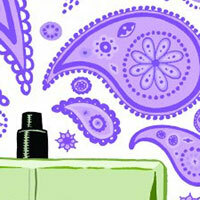 Finally, for the color stage, I wanted to be a little more “adventurous” than the limited palette which defines A.D. But again wishing to bring forward the Doctor and Anthony, I colored them with “hotter” and more saturated tones, while keeping the background elements more limited in palette. I then applied my “patented” texture pattern on top, and… voila! I printed the final illo on a nice ragstock paper at 11″ x 14″, and sent it off to Anthony, who had it professionally framed. From what I heard, the unveiling was a big success, and the print is now hanging in the Doctor’s house amidst his eclectic art collection. I drew this back in 2015 for a French comics magazine. 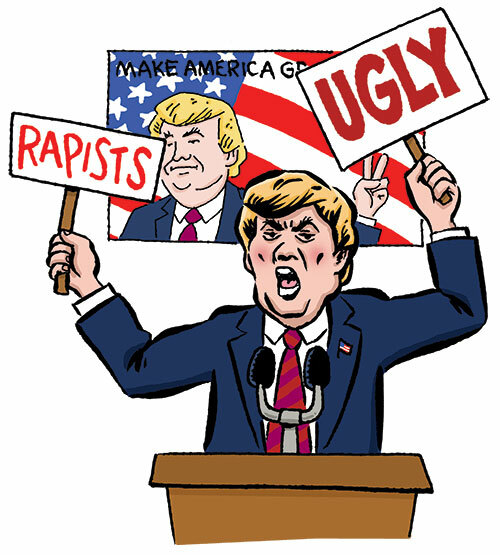 The concept was to illustrate some of the “weirdest” news stories of the year—you know, like the idea that Donald Trump was running for U.S. president..
One of the things I’ll never forget about the 2008 election was watching the returns on TV and also tracking it on my Facebook feed. Facebook was a relatively new phenomenon at that point, and the folks who were on it seemed to so epitomize the energy that the Obama team was bringing to the White House. I’ll also never forget that, late that night on November 4, a lone trumpeter paraded down Eastern Parkway (in front of my apartment building), tooting triumphantly on his horn for blocks and blocks and blocks. Back then, after eight years of George Bush, it all felt like a fresh start, like our country had taken a giant stride forward. Now, eight years later, our country seems to be making another “fresh start.” But it’s not something I can bear to witness with a crowd of folks. I’ll watch the inauguration here at home on my TV, but it’s hard for me to see this fresh start as anything but a giant stride backward. Matthew Baker—or Mx. Baker, as he prefers to be called—is a rather mysterious fellow who writes for a living. He contributed a wonderful “seeder” piece to the “Brothers” triptych of FLASHed (responded to by Jon Lewis and then Julia Fierro), and he curates a blog called Early Work, which (as you might guess) highlights the immature work of established writers and artists. My take on the blog is that the stuff each creator chooses shows hints of the themes and styles of their later, mature work. (Or maybe it’s just amusing to see how far they’ve come!) Folks featured on Early Work include cartoonist Anders Nilsen, writer Kelly Luce, and poet Naomi Shihab Nye, to name a few. And now… me. As you may know, I’m a bit of a hoarder and I have files full of old artwork, going back to my youngest days. (My mom and dad have their share of my childhood drawings as well.) So there was a lot of material to choose from. On the other hand, I was apprehensive about sharing my immature artwork with the world at large. But with Matt’s help, I was able to whittle down all that material to some stuff from my teenage years and early twenties that I wasn’t too embarrassed about: a collection of one-page comics I did for my dad for his birthday each year, a series of illustrations of roommates from my freshman-year college dorm, and a series of trompe-l’oeil illustrations I did for loved ones. One aspect of the Early Work site I really like is its “raw” quality—the drawings are presented on the wrinkled, yellowed paper they were done on. Stories are scrawled in a child’s hand. Nothing is cleaned up in PhotoShop. This is ephemera, often plucked from decades past. So I really tried to get into the spirit of that. Two of my biggest heroes when I was a kid were Frederick Douglass and Harriet Tubman. I had posters of them on my wall! I read Douglass’s autobiography a number of times, and I thrilled to the daring exploits of Tubman and the Underground Railroad. A number of brave former slaves even journeyed back across state lines into Kentucky to recruit slaves to escape back north with them! 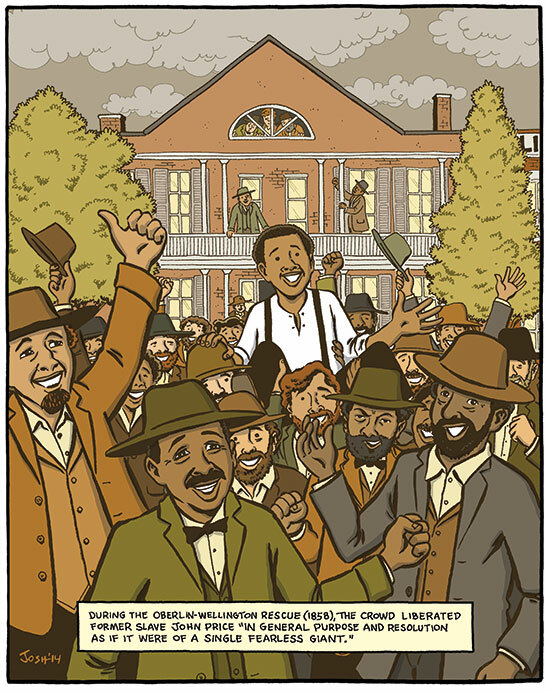 In a four-panel comic I did for the piece, I show what one hapless U.S. Marshall based in Oberlin was confronted with when he tried to enforce the Fugitive Slave Law, from being run off with a shotgun to being beaten with a walking stick, to finally being run out of town by a group of Oberlin citizens. Ha! I was given my choice of what to draw for a full-page illustration, and there were many amazing anecdotes of Oberlin’s place in abolitionism and the Underground Railroad. But the story I ultimately chose was a key moment in the Oberlin-Wellington Rescue. In 1858, an escaped slave named John Price was abducted by Southern slave catchers, who intended to bring him back to Kentucky. A large group of Oberlin residents, including many African-Americans, rushed to the nearby town of Wellington, where the slave catchers had holed up in a hotel for the night. In blatant defiance of the “law,” the Oberlin residents forced their way into the hotel and rescued Price. My illustration shows the aftermath of the rescue, as the joyous crowd of rescuers carry Price out of the hotel on their shoulders. Photos from the era showed many of the Obies who took part, as well as the Wellington hotel itself, all of which I incorporated as best I could into the illustration. I even portray the slave catchers, cowering up in the attic, peeking out the windows as their “prize” is taken away. It turned out that the Oberlin-Wellingto Rescue was a key moment in the lead-up to the Civil War. Ohio state officials defended the rescuers, despite their flouting federal law (the Fugitive Slave Law), and even tried to repeal the law at the 1859 Republican convention. (Remember, the Republicans were the “good guys” back then!) The resulting attention kept the issue of slavery very much in the public eye right up until secession and the shots fired at Fort Sumter. Seeing as how it’s Black History Month, I’m proud to share this story, and my visual representation of the Oberlin-Wellington Rescue, which has rarely been portrayed. 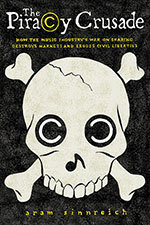 I illustrated the cover of Aram’s Sinnrich‘s new book, Piracy Crusade: How the Music Industry’s War on Sharing Destroys Markets and Erodes Civil Liberties (University of Massachusetts Press), and I thought I’d take you through the process. As the title indicates, Sinnreich’s argument is that so-called “piracy” is really the battle between those who believe information (e.g., music) should be shared and the media cartels who want to control that flow. In the spirit of openness, Aram even made a draft of the book available online under a Creative Commons license. 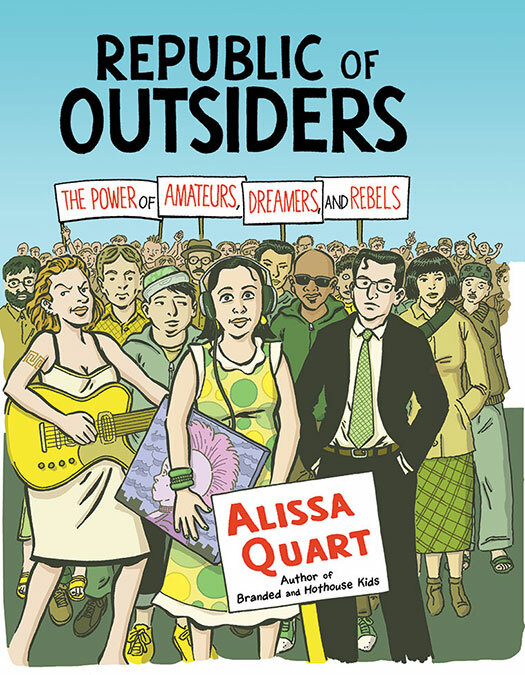 I illustrated the cover of Alissa Quart’s new book, Republic of Outsiders: The Power of Amateurs, Dreamers and Rebels (The New Press), and I thought I’d take you through the whole process. The book is about how a diverse group of outsiders who seek to redefine a wide variety of fields—from film and mental health to diplomacy and music, from how we see gender to what we eat—are succeeding in various ways in changing the status quo. So from the get-go the initial concept was to show a large crowd of people on the cover, something to convey the idea of “here comes everybody.” The book’s particular subjects—including an Occupy Wall Street “alternative banker,” a transgender activist, an autistic artist, and indie musician Amanda Palmer—would be prominently featured at the front of the crowd. 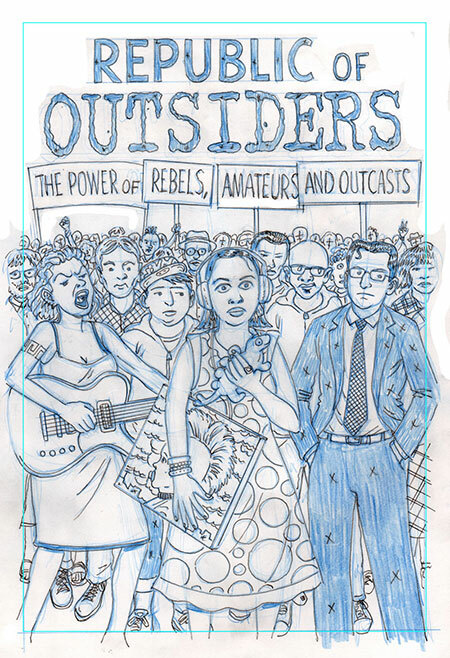 I wanted the art to “bleed,” to extend past the edge of the cover, to help convey the “infinite” size of the crowd of amateurs, dreamers, and outcasts (at that point the book was subtitled “The Power of Rebels, Amateurs, and Outcasts”). 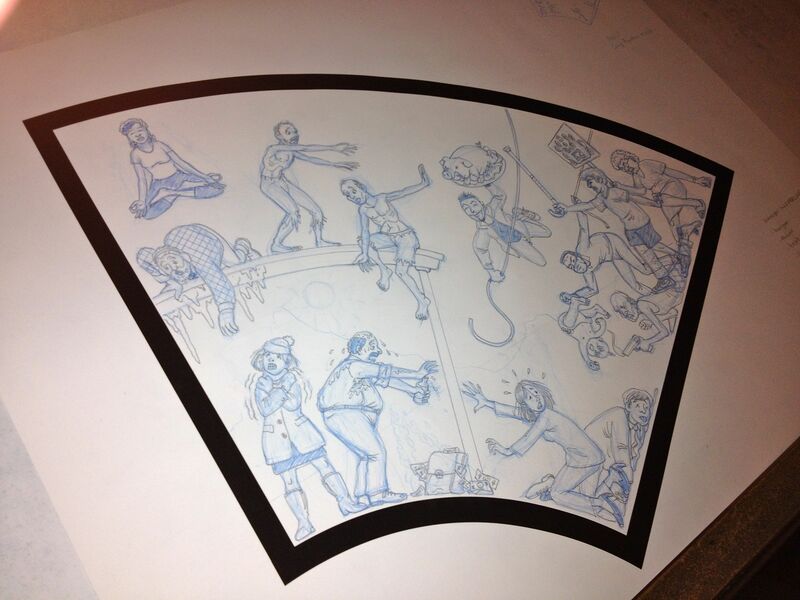 The client was pretty happy with the sketch, with their only major comment regarding the Amanda Palmer figure. Because of some recent negative press, they asked me to downplay her somehow—suggesting I “anonymize her, so she could be a more generic glam genderbending figure.” I pointed out that with my cartoony style I doubted many people who would recognize the character as Amanda Palmer, but I was happy to do as they asked. We also agreed that I would hand-letter the title and other cover lettering. Given that, the client felt the subtitle needed a little more air. At that point, I came up with the idea of the crowd holding signs making up the words of the subtitle. I thought it further sold the concept of this group being paet of a movement effecting change on society. Although generally happy with the pencils, the client asked for some changes. There was some concern that the central figure (based on a real-life autistic artist was “too prominent and particular.” One way they suggested to do that was to eliminate the plastic iguana she was holding and make her expression less vacant; the second adjustment took care of another unresolved issue, which was how to display the author’s name. They came up with the idea of setting in a foreground sign which also would partly cover the autistic character. In addition, feeling that the “Amanda Palmer” avatar was too aggressive, they asked me to tone down her expression a bit as well. Success! Everyone liked the new color treatment. So I was done, right? 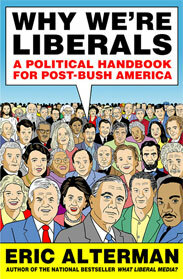 The book came out last month, and it’s been cool seeing my work on the cover—a first for a book I did not myself draw. Oops! I don’t remember ever seeing that book cover before, I swear!